By the grace of God, We at 2nd Chance Books have managed to send 249 books about Shia Islam to prisoners since March 2014. 43 different inmates in total have written us so far from the following states; California, South Carolina, North Carolina, Virginia, Florida, Pennsylvania, Mississippi and New York. I have attached a letter that we have received as an example of even Sunni’s that are eager to learn about the teachings of Ahl ul Bayt (as) and are interested in becoming Shia. During this Holy month of Ramadhan all of our good deeds are multiplied, so we would like to humbly ask you to take part in these blessings by helping aid and assist these brothers. It takes only $25 to sponsor a package of 6 books. 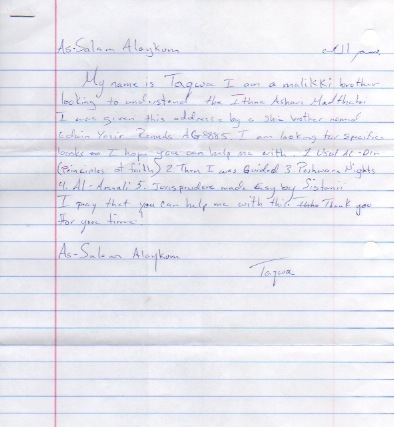 The way that you can help assist us in this great task is to visit www.yasinpublications.org/2nd-chance-books/ Once you go to the website an in-depth description of the program is located there and also you will see a donate button to send you contributions to sponsor a prisoner. We want to thank you all for your generous contributions and for all of your support. If you are not able to assist the program financially then please help us by sharing this post.